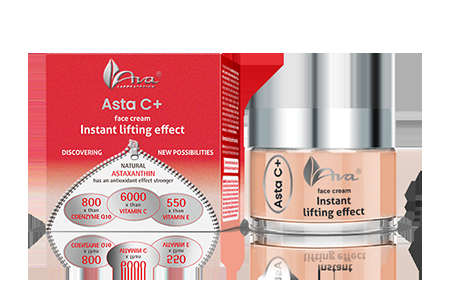 Astaxanthin used in the cream effectively reduces wrinkles, makes the skin smooth, soft and well-nourished. The carotenoid, derived from micro algae, is the strongest natural antioxidant known in nature. It has a strong rejuvenating effect: accelerates the epidermis regeneration, captures free radicals, reduces discolourations. Vitamin C stimulates the production of collagen in the epidermis and hyaluronic acid provides its proper hydration. As a result, the skin becomes firm, elastic, moisturized and effectively smoothed. Extracts from carrot and Indian tamarind, rich in vitamins and minerals, complement the regenerative and nourishing effect of the cream.